All 9D Capsules contain Docosahexaenoic acid, L-methylfolate, Methylcobalamin, Pyridoxal 5-phosphate and Vitamin D3. 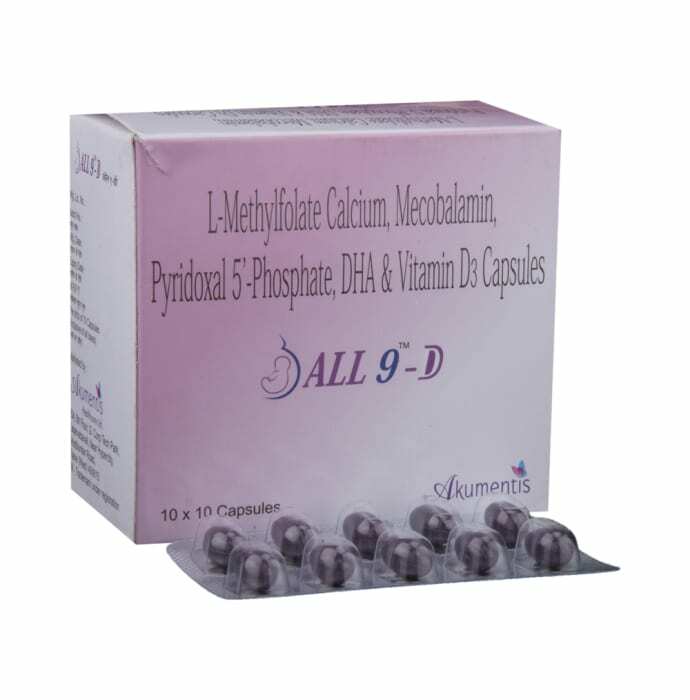 All 9D Capsules contains all active form of vitamins would be rationale approach to prevent Neural Tube Defects (NTDs), pregnancy related anaemia and associated pregnancy complications due to elevated homocysteine levels. L-methylfolate is the active form of folic acid used by your body. L-methylfolate is proven to lower levels of homocysteine (an amino acid linked to pregnancy complications). A licensed pharmacy from your nearest location will deliver All 9 -D Capsule. Once the pharmacy accepts your order, the details of the pharmacy will be shared with you. Acceptance of your order is based on the validity of your prescription and the availability of this medicine.